Avoid expensive damages on your house, caused by clogged gutters and use our professional gutter cleaning services. We operate all over Battersea and we extended our working schedule to maximum, so that everyone can get advantage of our services. Our cleaning technicians are well-trained and experienced people, who know how to cope with any kind of clogged gutters. The modern tools and technologies which they use are vital for their work in order to return the shine of your gutters again. Don’t deprive your home from the clean gutters, because now the prices are really reduced. Hurry up and contact us. 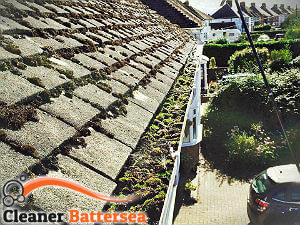 Don’t put off the cleaning of your gutters, because otherwise you risk to pay for an expensive repair of your house. 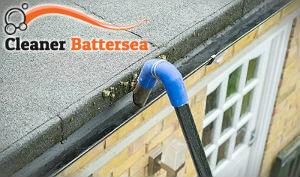 Better let us save your money with our gutter cleaning services, which we provide all around Battersea. Our cleaning crew is always on the dot and you don’t have to worry about anything. They will unclog your gutters and even clean them till they shine again. Moreover, you don’t have to bother yourself about the mess; our cleaning technicians will clean everything behind themselves. We do understand the responsibility to clean your gutters in an immaculate way and we can give you a guarantee and even provide you with pictures of your gutters after the cleaning. If you don’t see the problem, this doesn’t mean that there is no problem. Gutters are important to lead the rain water from your house, but if they are clogged with leaves and twigs. For all the residents in SW11, we have the solution: our gutter cleaning services, which won’t empty your pocket and will save you costly damages. We are at your disposal every day, around-the-clock, including the weekends. For more information, contact our friendly representatives and get your personal quote.